Permaculture Is the conscious design of human living environments that are reflections of the ecological principle that underlies nature. This principle is applied to all aspects of the human endeavor to attune civilization into the greater universal system. It is the harmonious integration of landscape and people providing their food, energy, shelter and other material and non-material needs in a sustainable way. Permaculture design is a system of assembling conceptual, material, and strategic components in a pattern which functions to benefit life in all its forms. Permaculture starts by generating the resources our new sustainable civilization requires from renewable sources freely provided by nature, everywhere… This is why permaculture has a strong agricultural or better stated, agroecological focus, as human society is resource driven. 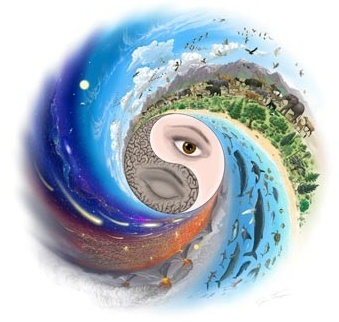 Nevertheless permaculture is a whole system design approach and so its reach is total in the sense that every element of planetary existence falls into the focus of the permaculture design process as we attempt to redesign our way of living on earth. Permaculture combines many different systems and approaches into a holistic ecological pattern of design and application. Permaculture designers make use of design approaches such as Keyline Design developed by P.A. Yoemans where appropriate to establish a broadacre catchment area water harvesting pattern into which other elements of the permaculture design are arranged and placed. We make use of the Holistic Management system developed by Alan Savory to understand and manage ecosystems and our designs effectively. Savory’s holistic grazing management system is of particular importance in improving ecosystem health on broadacre dyland farms, especially when combined with Keyline soil improvement systems. Ultimately there is no limit as to what can be integrated into permaculture designs, whether it be technology, management processes, land-use techniques, strategic approaches and settlement arrangements and to what aspect of the human cultural and economic matrix are integrated, as long as these applications and systems conform to the ethics and principles of permaculture. CARE FOR THE EARTH: Look after our planet, and everything that lives on it. CARE FOR THE PEOPLE: Look after each other. SHARE OUR RESOURCES: Sharing our extra resources with others so they too may live healthy and prosperous lives. PROMOTE LIFE: All forms of life have a right to exist. Our efforts as designers are directed towards enhancing and promoting life in all it’s wonderful and diverse forms. The principles of Permaculture are the principles of nature. If you implement the principles on the land they lead to ecologically based sustainable human settlements. Using permaculture principles in land-use projects leads to a foundation or pattern for a cultivated ecology that can be implemented under most climatic and geographical situations. This is because permaculture systems function as ecological systems, and if the species and element selection and arrangement is aligned with the local environment, the human settlement will be in harmony with its environment. Good design and community development depends on a free and harmonious relationship to nature, in which careful observation and thoughtful interaction provide the design inspiration, repertoire and patterns. It is not something that is generated in isolation, but though continuous and reciprocal interaction with the subject. Permaculture uses these conditions to consciously design our living environments for energy efficiency and integration. The core of this approach is emphasizing ourselves in nature and transformed by it. It can be seen as the keyhole in nature through which one sees the solution. The proverb “beauty is in the eye of the beholder” reminds us that the process of observing influences reality and that we must always be circumspect about absolute truths and values. It is our responsibility to identify and act upon opportunities to capture local flows of both renewable and non-renewable forms of energy. Doing this provides us with the energy by which we can rebuild capital as well as providing us with “income” for our immediate needs. This principle deals with the long-term storage of energy as savings and investment to build natural and human capital. The proverb “make hay while the sun shines” reminds us that we have limited time to catch and store energy before seasonal or episodic abundance dissipates. We need a basic understanding of energy laws; the foundation for all that is possible in nature and human affairs. Understanding these energy laws is fundamental to developing sustainable Permaculture based livelihoods as these are the laws of ecology. The previous principle focused our attention on the need to use existing wealth to make long-term investments in natural capital. But there is no point in attempting to plant a forest for the grandchildren if we haven’t got enough to eat today. Obtain a yield reminds us that we should design any system to provide for self-reliance at all levels (including ourselves) by using captured and stored energy effectively to maintain the system and capture more energy. Flexibility and creativity in finding new ways to obtain a yield will be critical in the transition from consumption to production. Elements and systems that do generate immediate yield will proliferate while those that don’t will wither. A yield profit or income functions as a reward that encourages, maintains and replicates the system that generated the yield. In this way successful systems spread. If we are serious about sustainable design solutions, then we must be aiming for rewards that encourage success, growth and replications of those solutions. Renewable resources are those which are renewed and replaced by natural processes over reasonable periods without the need for major non-renewable inputs. Renewable resources should be seen as our sources of income, while non-renewable resources should be seen as capital assets. Spending our capital assets for day-to-day living is unsustainable in anyone’s language. Permaculture design should aim to make best use of renewable natural resources to manage and maintain yields, even if some use of non-renewable resources is needed in establishing the system. We need to restore the balance between renewable and non-renewable resource use. Renewable resources are those we gain from the natural elements, plants, animals, and living soil and water without them being consumed. For example if we use a tree for wood we are using a renewable resource, but when we use a tree for shade and shelter we gain benefits from the living tree that are non- consuming and require no harvesting energy. This understanding is obvious and powerful in redesigning systems where many functions have become dependent on non-renewable and unsustainable resource use. The proverb “let nature take its course” reminds us that human intervention and complication of processes can make things worse and that we should respect and value the wisdom in biological systems and processes. This principle brings together traditional values of frugality and care for material goods, recycling all we can, the mainstream concern about pollution, and the more radical perspective that sees wastes as resources and opportunities. Pollution is an output of any system component that is not being used productively any other component of the system. This definition encourages us to look for ways to minimize pollution and waste through designing systems to make use of all outputs, so that a cycle is established and all is reused. This enables permaculture systems to generate their own resources from within rather than relying on external inputs. The proverb “waste not, want not” reminds us that it is easy to be wasteful when there is an abundance but that this waste can cause later hardship. “A stitch in time saves nine” reminds us of the value of timely maintenance in preventing waste and work involved in major repair and restoration efforts. The first 6 principles tend to consider systems from the bottom-up perspective of elements, organisms and individuals. The second six principles tend to emphasize the top-down perspective of the patterns and relationships that tend to emerge by system self-organisation and co- evolution. The commonality of patterns observable in nature and society allows us to not only make sense of what we see but to use a pattern from one context and scale to design in another. Pattern recognition (Principle 1 Observe and interact), is the necessary precursor to the process of design. The spider on its web, with its concentric and radial design, evokes zone and sector site planning, the best-known and perhaps most widely applied aspect of Permaculture design. The design pattern of the web is clear, but the details always vary. Complex systems that work tend to evolve from simple ones that work, so finding the appropriate pattern for that design is more important than understanding all the details of the elements in the system. The proverb “can’t see the wood (forest) for the trees” reminds us that the details tend to distract our awareness of the nature of the system; the closer we get the less we are able to comprehend the large picture. In every aspect of nature, from the internal workings of organisms to whole ecosystems, we find the connections between things are as important as the things themselves. Obtain a yield and Apply Self- regulation and Feedback cover some aspects of integrated systems from the bottom up perspective of the elements or individuals. How does each element (or person) look after its own needs through self-reliance and contribute to the large system. Design from Patterns to Details emphasized the top-down perspective in order to identify and apply appropriate patterns that guide the design and self-organizational growth of elements and relationships (the details). This principle focuses more closely on the different types of relationships the draw elements together in more closely integrated systems, and on improved methods of designing communities of plants, animals and people to gain benefits from these relationships. The ability of the designer to create systems that are closely integrated depends on a broad view of the range of jigsaw-like lock-and-key relationships that characterize ecological and social communities. As well as deliberate design, we need to foresee and allow for effective ecological and social relationships that develop from-organization and growth. The abstract whole system both arises from the organization of the elements and also gives them form and character. In developing an awareness of the importance of relationships in the design of self-reliant systems, two statements in the Permaculture concept have been crucial. Every component of your garden should function in many ways. This means when you place a species or structure make sure it provides at least 3 functions so that it can serve the needs of other species and elements in the system. Pest control, soil fertility, water catchment and irrigation, mulch and food provision, etc… must be served by more than one element. This means if one element fails in its task to provide a service (pest control chickens get eaten by a dog), than there must be back up by at least 3 other elements to ensure sustainability (plants, ducks and wild birds control pests). Observe this principle and the basic needs of your cultivated ecology will be met consistently from within the system. Apply these statements to systems design and the end result is integration. Apart from integrating elements into systems we need to place systems and elements are most effective. Place your vegetable garden between the house and the chicken run so on your way to feed your chickens you can collect greens and insects from the garden to feed the chickens. Put your compost heaps next to the chicken run so that you do not have to carry your manure great distances to reach your compost area. Place the greenhouse next to the chicken run and the garden so that the greenhouse can keep the chickens warm at night and your chickens can warm the greenhouse. By placing the greenhouse near the vegetable garden it is easy to transfer seedlings into the garden and we don’t have to carry them great distances. By putting the elements where they are most needed we, reduce the amount of work and energy we have to expend. The proverb “many hands make light work” reminds us of the intangible benefits from collective rather than solitary action as well as the more general synergistic nature of integrated systems in which the whole is greater than the sum of the parts. Systems should be designed to perform function at the smallest scale that is practical and energy-efficient for that function. Human scale and capacity should be the yardstick for a humane, democratic and sustainable society. Wherever we do anything of a self-reliant nature – growing food, fixing a broken appliance, maintaining our health – we are making very powerful and effective use of this principle. Whenever we purchase from small, local businesses or contribute to local community and environmental issues we are also applying this principle. The speed of movement of materials and people (and other living things) between systems should be minimized. A reduction in speed is a reduction in total movement, increasing the energy available for the system’s self-reliance and autonomy. Speed, especially of personal movement, generates high levels of stimulation that drown out the subtle and the quiet. The proverb “the bigger they are, the harder they fall” is a reminder of one of the disadvantages of size and excessive growth. The proverb, “slow and steady wins the race” is one of the many that encourage patience while reflecting a common truth in nature and society. The great diversity of forms, functions and interactions in nature and humanity are the source for evolved systematic complexity and stability. The role and value of diversity in nature, culture and Permaculture is itself complex, dynamic, and at times apparently contradictory. Diversity needs to be seen as a result of the balance and tension in nature between variety and possibility on the one hand, and productivity and power on the other. It is now widely recognized that monoculture is a major cause of vulnerability to pests and diseases, and therefore of the widespread use of toxic chemicals and energy to control these. Polyculture is one of the most important and widely recognized applications of the use of diversity, but is by no means the only one. Diversity between cultivated systems reflects the unique nature of site, situation and cultural context. Diversity of structure, both living and built, is an important aspect of the principle, as is the diversity within species and populations, including human communities. The proverb “don’t put all your eggs in one basket” embodies the common sense understanding that diversity provides insurance against the vagaries of nature and everyday life. Eastern spiritual traditions and martial arts regard peripheral vision as a critical sense that connects us to the world quite differently to focused vision. This principle reminds us to maintain awareness and make use of edges and margins at all scales in all systems. Whatever is the object of our attention we, we need to remember that it is at the edge of any thing, system or medium that the most interesting events take place; design that sees edge as an opportunity rather than a problem is more likely to be successful and adaptable. The beach where the ocean and the land meet is a good example of the power of the edge because the edge is a place where two or more environments meet, making the energy of both environments available for use there. This is a reality well recognized by surfers. In the process, we discard the negative connotations associated with the word “marginal” in order to see the value in elements that only peripherally contribute to a function or system. It is from these peripheral elements that some of the most innovative solutions to today’s challenges emerge. “Don’t think you are on the right track just because it is a well-beaten path”, reminds us that the most common, obvious and popular is not necessarily the most significant or influential. This principle has two threads: designing to make use of change in a deliberate and co-operative way, and creatively responding or adapting to large-scale system change that is beyond our control or influence. The acceleration of ecological succession within cultivated systems is the most common expression of this principle in Permaculture. These concepts have been applied to understand how organizational and social change can be creatively encouraged. As well as using a broader range of ecological models to show how we might make use of succession. Although stability is an important part of Permaculture, evolutionary change was essential. Permaculture is about the durability of natural living systems and human culture, but this durability paradoxically depends in large measure on flexibility and change. While it is important to integrate this understanding of impermanence and continuous change into our daily consciousness, the apparent illusion of stability, permanence and sustainability is resolved by recognizing the scale-dependent nature of change discussed in Design from Patterns to Details. In any particular system, the small scale, fast, short-lived, cyclic changes of the elements actually contribute to higher-order system stability. A contextual and systematic sense of the dynamic balance between stability and change contributes to design that is evolutionary rather than random. The proverb ”vision is not about seeing things as they are but as they will be”, emphasizes that understanding change is much more than the projection of statistical trend lines. It’s about seeing the potential inherent on all things and processes. It also makes a cyclical link between this last design principle about change and the first about observation.